Front yard view of this renovated Laurelhurst home, expanded onto the adjacent lot. The client purchased an adjacent house, removed the structure, and merged the two lots to create a single lot large enough for an addition. The new combined lot is on a corner and has access from two sides. 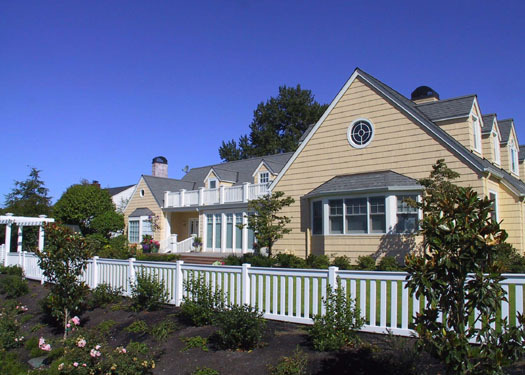 Remodel and expand an existing Cape Cod style house with shingle siding. 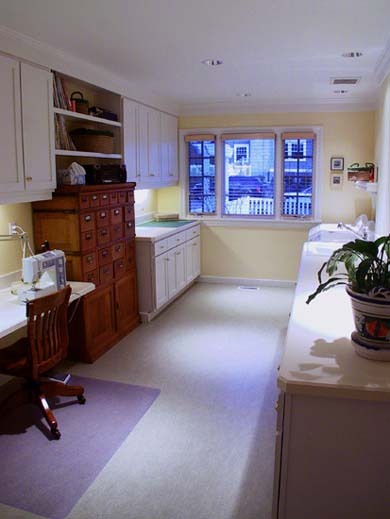 A new dining area next to the kitchen. A main level with a family/living room, laundry/sewing room, two car garage, and mud entry. 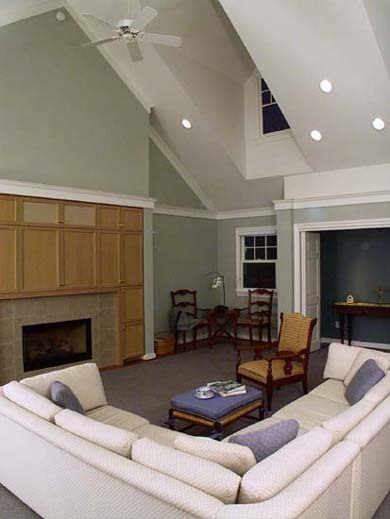 An upper level with a guest bedroom, TV/play room, hall bath, a stairway, and an exercise/sitting room adjacent to the master suite in the upper story of the existing portion of the house. Matched the exterior and roof planes of the addition to the existing Cape Cod house. 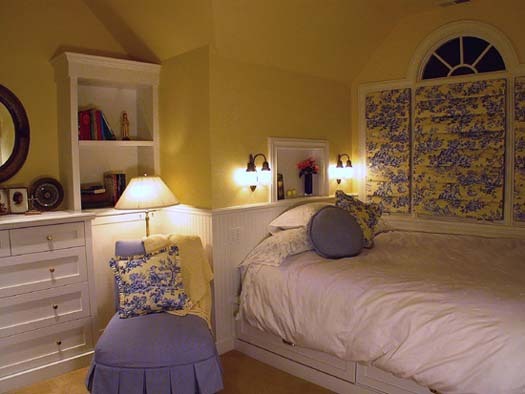 All windows and doors are painted wood. 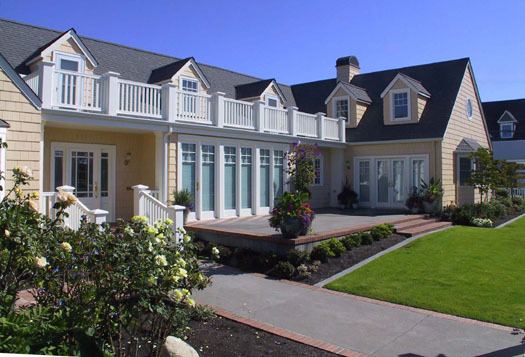 Placed the garage on the side street away from the existing main entry of the house and positioned new family/living room prominently on the corner to take advantage of the views of the garden and Lake Washington. 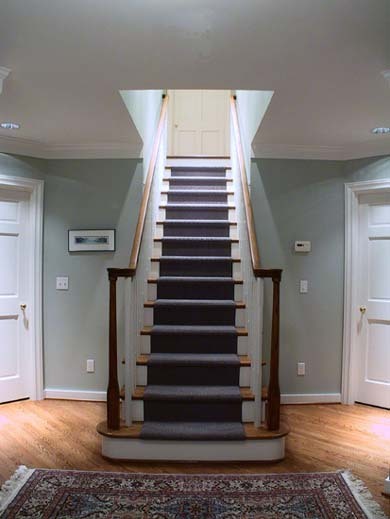 The stairway was built between a new mud entry (to the garage and back yard) and the living/family room. 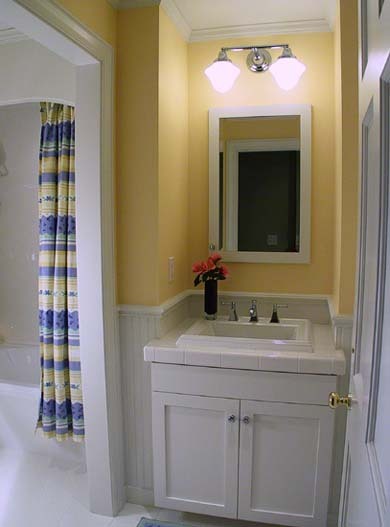 A half-bath, laundry, and other utility and storage spaces are adjacent to the mud entry for convenient access. Turned the old family room next to the kitchen into a new dining room, expanded to handle a large custom table with seating up to 12. Tall custom doors provide direct access to a new front-yard patio. 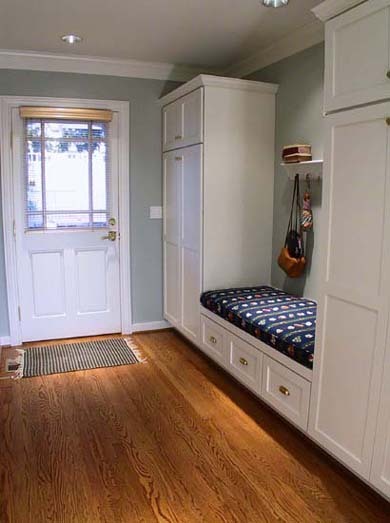 Replaced the existing entry foyer with one that contains two coat closets. Laid out a guest bedroom, TV/play room, hall bath, and an exercise/sitting room in the upper level of the addition, with access from the master suite in the upper story of the existing house and from the stairway. Glass doors open to an expanded roof deck that overlooks the front yard and view of Lake Washington. Added a new concrete walkway with brick trim to match the new patio next to the new living/family room and remodeled dining room. Expanded an existing deck and landscaped patio in the backyard to integrate the new addition. Replaced the mechanical system for the whole house with a hydronic/forced air system for space heat and hot water. Updated electrical systems and added a security/communications system. The original house included the left side up to the second dormer. Everything to the right is new construction. 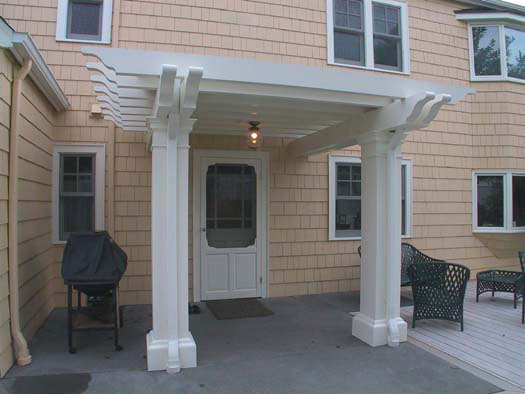 Renovated front entry with new walkway and patio. 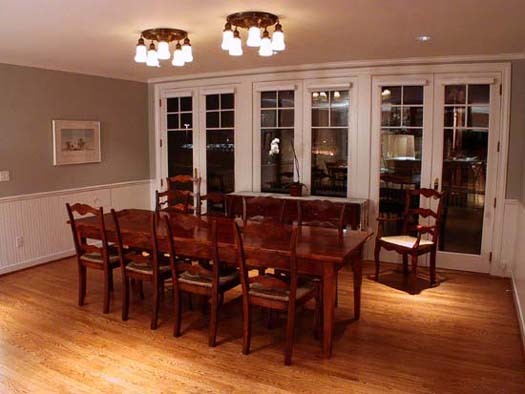 The bank of custom French doors are part of the newly constructed dining room. Formal dining room with the bank of French doors seen from outside in the previous photo. 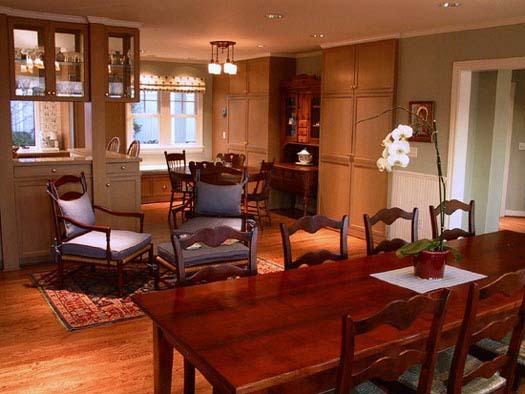 Dining room from the other direction, showing part of the kitchen (left) and casual dining area in the background. 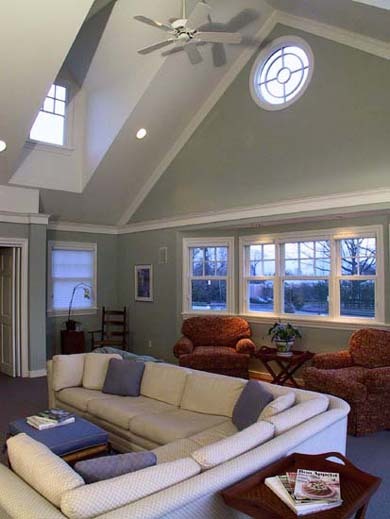 Family room with large bay window and cathedral ceiling in newly built wing. Family room from the other direction, showing the fireplace surrounded by custom cabinetry. 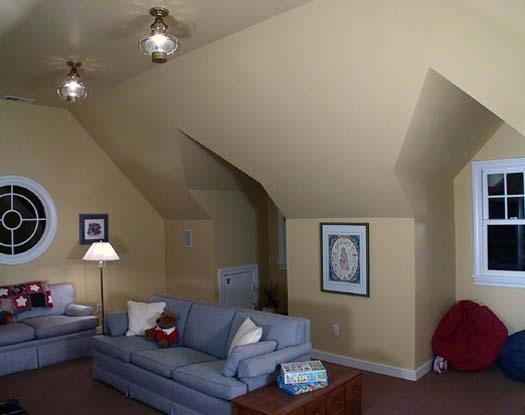 The doors above the hearth open to a plasma-TV entertainment center. The speaker grilles are visible above. Backyard entrance with arbor and expanded patio, leading to the mud room. Mud room leading from the back entrance to the laundry room and family room. Central staircase leading to the master suite, guest bedroom with bath, and bonus room.